Known as The Angel Whisperer to stars, 29-year-old Glaswegian hipster, Kyle Gray is an award-winning, international best-selling author and sell-out inspirational speaker. As a Lululemon yoga and meditation ambassador and mostly found dripping in Vivienne Westwood - there’s no tie dye in sight for this ‘spiritual teacher’. Kyle was once known as the youngest psychic in the UK with his extraordinary talent first coming to light when he was a mere slip of a lad at four years old. Kyle’s grandmother lived in the family home and as a result, he recalls forming a particularly close bond with her. When she became so ill that she was admitted to hospital, Kyle’s mother and father stayed with her while a neighbour looked after Kyle. Kyle remembers waking up giggling that night with his back being tickled by his “nana.” He just presumed she had returned from hospital and fell straight back to sleep. When he woke up in the morning, he asked where she was and his mother had to explain that Kyle’s grandmother has passed away the night before. That was Kyle's first encounter with the spirit world, but his first actual angel sighting didn't happen until he was 15. Kyle decided to give his new angel cards a whirl at a barbecue. Instantly he saw a gold energy standing behind his subject and the words to Destiny's Child’s Survivor began booming in his mind. This man's angel was telling Kyle he was a survivor. When he relayed this message, the man quickly scooped up the deck of cards, placed them in a neat pile and said “Enough.” Later that day Kyle found out that the man had tried to take his own life several times but had never succeeded due to what seemed like divine intervention. That’s when Kyle began looking for answers. He visited a spiritualist church on a weekly basis and started taking his angel cards to school and giving readings to the teachers and cleaners. Kyle has since become the fourth generation of psychics in his family, not exactly unexpected since his mother was summoned to a psychic night one evening when Kyle was six. The psychic refused to see anyone until Kyle’s mum arrived. When she went in, this lady sat her down and told her, “By the time your son is seventeen years old he’ll be known nationally for being the same as me.” At 17, Kyle earned professional status as a psychic and started working with the Government’s Scottish Enterprise. Aged 18, he appeared on Soap Star Super Star, giving psychic predictions. Having been ridiculed for his craft, Kyle began suppressing his extraordinary talent, studying music at Glasgow School of Art. He became a recognised DJ, known as MGCK, who played at Rock Ness and Notting Hill Carnival with the likes of Sam Sparrow and Calvin Harris. However, Kyle could not escape his destiny. Before long The Scottish Sun approached him, asking to test his talents in a new psychic Tuesday pull out, The Oracle. When the column launched in September 2009, Kyle’s new career soared into orbit. His bagged himself a regular column, a Hay House book deal and the rest is history. 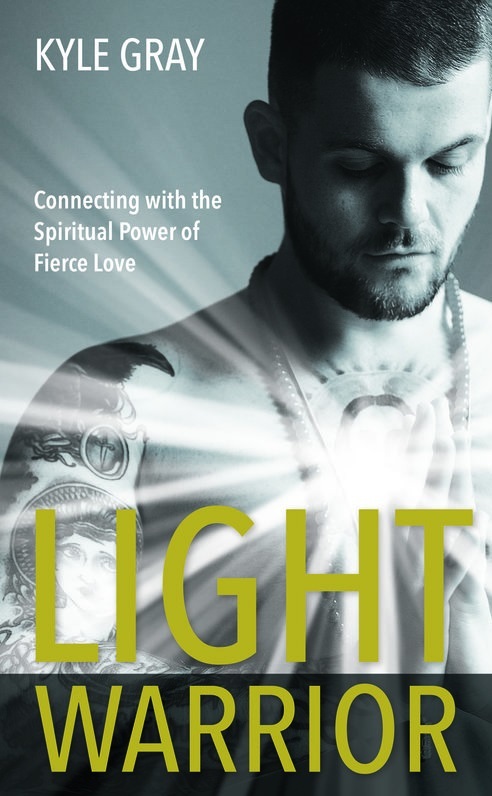 Five best-selling Hay House books, an oracle card set, countless International speaking gigs and brand collaborations with dedicated following including several celebrities to name later - he’s announcing his next book, Light Warrior, due out for release this Autumn. Light Warrior is a book unlike any other book written by Kyle. It’s a true reflection of his colourful journey to date, with a real focus on inviting the modern wellness world into his world to share their soul not just their selfies. Given his fashion-set following, including Kelly Cutrone and Vivienne Westwood, it’s clear there’s a burgeoning scene awaiting his input that’s way beyond green juices and HIIT sessions on Instagram! Published by Hay House, Kyle Gray’s latest book, Light Warrior is available for pre-order via Amazon today and available on general release 3rd October 2017. For the last 15 years I’ve dedicated my whole existence to the understanding, study and experience of a force that I call The Angels. Ever since I was a teenager I’ve had this incredible connection to angels – as soon as I started to study them I realized that it was something I already knew: I was remembering on a soul level. I feel what I do best is help people understand that they have the capacity to develop a relationship with the Divine. So many people have heard stories about angels about others experiencing angels but they often never think that this is possible for them or even more so if they are worthy. I feel my own life is an example that miracles are possible. To think I came from a bumpy childhood, single parent household, overcame a paralysis with a life threatening virus and dropped out of school at 15 shows anyone that we can bring our dreams to reality. Even though I didn’t stick school and left with terrible English and grammar skills, I knew deep inside that I was going to write and share my story. I knew that there was a bigger mission than learning to write on a professional level – it was to help others know that they never walk alone. Angels are real! I’m grateful to be a living example of living your dream, 6 books later and 56 international publishing deals – I stand here knowing that what I do best is help people remember that they can commune with the Divine. Growing up – my mum always taught me that honesty is the best policy. I really believe in the power of integrity and staying true to myself and others. I believe that in order for me to be my best self I must constantly align with truth and check in with truth. In my 5th book, Raise Your Vibration, I have a lesson in there called ‘My truth is my teacher’ – it’s a lesson encouraging us to consistently align with truth. When we are aligned with truth we will be manifesting an experience in life that is filled with integrity. In every moment, opportunity, relationship, conversation and experience I always stay and aim to stay with truth. I’ll always be honest, I’ll share my input, how I feel and I’ll do it in the most loving way possible. I have been known to be sharp and assertive but yet I know I’ve still got a capacity to do it in the most loving respectable way possible. My personal goal was to have my own home and I’ve just achieved it. For as long as I remember I’ve had this inner vision of a loft conversion apartment that had a spiral staircase and was decorated in vintage Indian and industrial furniture. I’m living my dream. On a business level I never really knew where I wanted it to go – I didn’t realize that I would end up with a successful online business running on the back of my gifts and offering. It feels really exciting being able to hold a sacred online space and share with others everything I have learned about to this point. I am thrilled by the feedback and hearing that many of the people that have joined my tribe becoming quite the intuitive and skilled at angel card readings. My goal now is to help others recognize their gifts and light up the world with them – while feeling supported as I support others. My biggest success is simple: living a life I am in complete love with!! Thank YOU Angels! I’ll never forget having a really great conversation with a mentor and friend, Robert Holden. Robert’s work and guidance has been so pivotal to my grounding and my success. I remember in our conversation one time after speaking at a festival he asked me something like “What is one thing you can take away from this weekend that will be supportive of your growth” and I took a moment to reflect upon the day. I had been so nervous about how many people were going to come to my talk. I was so on edge – I wanted to make the promoter happy and I wanted to make those coming happy. I remember in that moment of uncertainty and anxiety handing over the situation to my angel team. I let them lead the way. So upon reflection the one thing I realized was that I couldn’t allow a number to represent or reflect my self-worth. No amount of people, no amount of money or achievements will ever amount to my own self-worth. My inheritance is love – that’s it. That was a big success – recognizing that. I think my most challenging time would be school. I was the weird kid in school that found it difficult to focus and get the work done. I was always teased for my personal image from peers and my teachers always told me that I would amount to nothing. I remember the day I walked out of school: the math teacher said that she had never met a bigger bunch of idiots in her life to my whole class. I couldn’t stand it any longer – I was not born to be abused and I stood up. I was told that If I didn’t like her comment then to leave. It was the last day of school, forever and the beginning of a beautiful journey. I don’t have mottos – I have prayers that I say daily and consistently. There’s so many notiable people that have been incredible role models in my life. 1. My mother – she’s been the greatest support in my life and my biggest believer. 2. Jesus – the living incarnation of divine love. 3. Louise Hay – the creator of my publisher, she’s a real angel. 4. Thich Nhat Hanh – the greatest living Buddha in the world. 5. Robert Holden – my mentor, teacher, coach. I love Scotland – it’s my home. It’s so funny because I always thought that when I started travelling the world I was going to find another place that I would call my home, but Glasgow has my heart. One thing I really love about it here is the ability to be in the mountains within an hour. You can go city to mountain in such a short space of time – it’s glorious. Another place that I love is South India. I went to Mysore to study Yoga for 1 month and it was one of the greatest experiences of my life. Last place – New York. It’s so strange I had such an initiation in New York where I met this Buddhist Lama who gifted me photos of the Dalai Lama and prayed over me – it was beautiful. Favorite item would be my first ever Angel card deck – they’re so old and falling apart, there’s scotch tape holding them together. Another thing that I adore is the original painting I have from Lily Moses of the Ascended Master Sanat Kumara – it’s a huge tall painting that’s almost as tall as me. I was so grateful when it arrived as a gift from Australia. Currently I am in love with Crossfit / Functional Training. I love the moment when I get to the gym, I’m pushed to my max every time. It doesn’t matter how challenging my day has been I always emerge from the gym feeling lifted, excited and inspired. I love seeing my body be as strong as it is and I love seeing my limits being pushed. Another passion – cooking plant based food. I’m not strictly vegan but I love vegan food and vegan cooking and I’m always rustling up super healthy food in the kitchen. It feels good to make things from scratch that light my body up from the inside.